Vishy Anand will have the white pieces against Magnus Carlsen in the first round of the 2015 Gashimov Memorial in Shamkir. Before the first international supertournament in two months we take a look at the chances of the players, with perennial favourite Carlsen facing the challenge not only of “veteran” ex-World Champions Anand and Vladimir Kramnik, but also the hungry young talents of Fabiano Caruana, Anish Giri, Wesley So and Maxime Vachier-Lagrave. 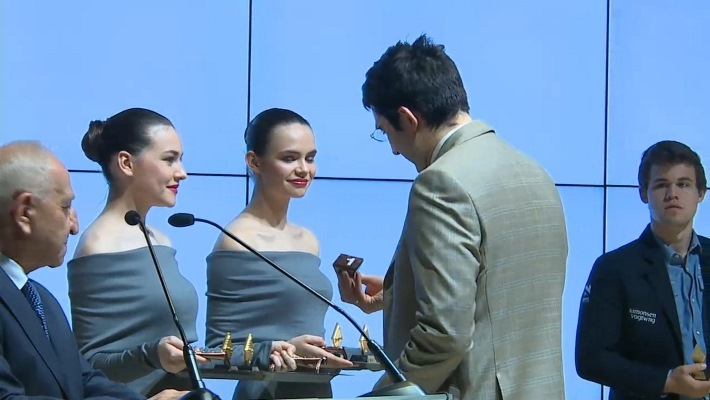 Vladimir Kramnik picks out no. 1 as the current no. 1 looks on! The games start at 15:00 Azerbaijan time (11:00 London, 12:00 France, 06:00 New York – sorry, US chess fans!) on Friday 17 April and can be followed live here at chess24 with computer analysis, chat and commentary in English, Russian or Azerbaijani (just choose your flag under the video). You can also see all the pairings for all the rounds. This year’s Shamkir Chess tournament promises to be even better than the first edition in 2014. It’s not just the line-up but the fact that a 10-player single round-robin is almost always more appealing than the dreaded 6-player double round-robin format last year. We get more players, more games and much greater variety. The downside is that there’s no B Group this year, but that’s perhaps more of a blow to the players who might have been involved than the average chess fan. So will he be rusty after all that time out? Well, probably not much more than most of his rivals, and he did of course win the last supertournament he played. He also won in Shamkir in 2014, though after starting at a canter with wins with the white pieces over Mamedyarov and Nakamura he was beaten by Caruana and Radjabov in rounds 4 and 5. The pairing, objectively for me, is terrible. Five black games and a very difficult game with Anand in the 1st round. On the other hand, the last game with the black pieces against Vishy Anand didn’t go so badly! We almost had three ex-World Champions in the field, since Veselin Topalov had initially agreed to take part before pulling out, but Michael Adams – a late replacement for Teimour Radjabov – is unlikely to look out of place. You might argue that the chess world in recent years has caught up with the Englishman’s style, since now everyone is following his habit of making curious “not the computer’s first line” moves that actually turn out to be far from bad and have a deep point. Adams’ renaissance includes a 2013 victory in Dortmund and he’s been in good form recently, helping Baden-Baden to a 10th successive German title. His only bad defeat? 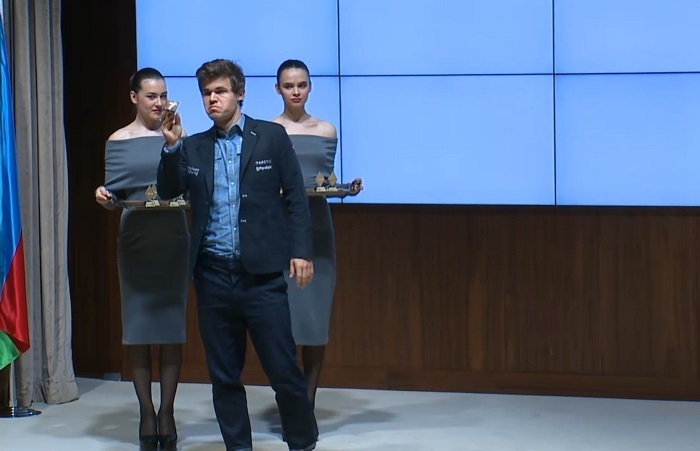 Against Magnus Carlsen, the man he seconded for the World Championship match, in the GRENKE Chess Classic. Vishy Anand, meanwhile, has also been on the rise, winning top events in 2014, holding Magnus Carlsen for much of the World Championship match, and then winning the London Chess Classic and the classical section of the Zurich Chess Classic. Sandwiched between that was a miserable outing in the GRENKE Chess Classic, but what’s clear is that Vishy has lost little of his great potential. The same can almost be said of Vladimir Kramnik, but you need to look a long way back to find the last supertournament the Russian actually won – the 2011 London Chess Classic, as far as we can tell. True, since then he did have one of the tournaments of his life in the 2013 Candidates, though he lost out on tiebreaks to Magnus Carlsen, and chess history took a different path. 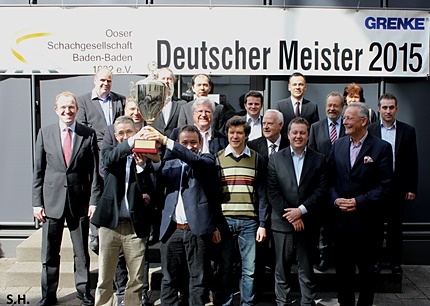 In 2015 he managed to get warmed up enough to win the rapid section of the Zurich Chess Challenge, but then he disappeared from the board for another two months. I think it’s just connected with the fact that so far I’m the only one who can manage not to have a disastrous score against Magnus, but it will probably change pretty soon. 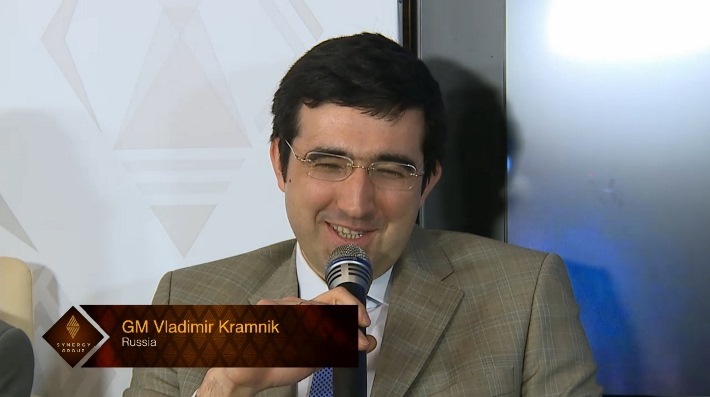 In any case, winning this event would be a huge achievement for Kramnik, and he’s one of those players who genuinely enjoys a challenge. 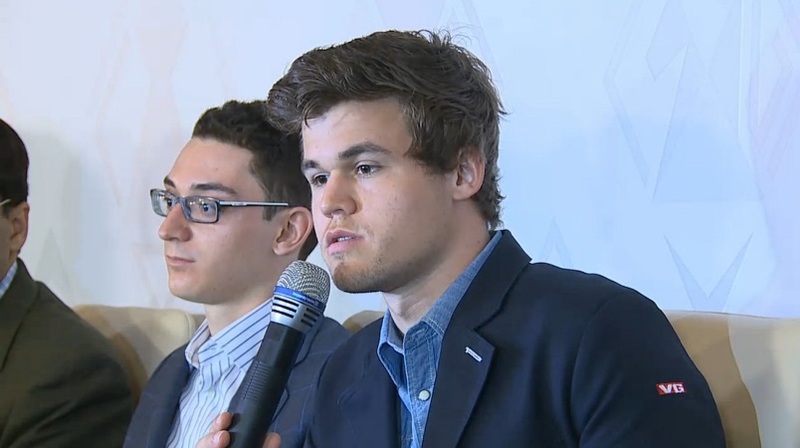 Magnus Carlsen is, amazingly, only the 5th youngest player in Shamkir, and he knows that any sign of weakness will be seized upon. Will Caruana be Carlsen's toughest rival in the years to come? At some point last year it would have been natural to give a whole section to Fabiano Caruana, but since then, despite still being world no. 2, he can’t lay claim to be more than first among equals in the group a distant second to Magnus. 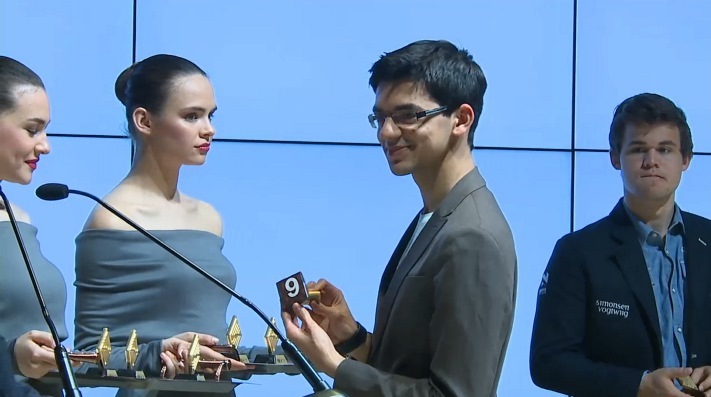 He finished 4th in Baden-Baden, last in Zurich and 7th in Wijk aan Zee, where Vachier-Lagrave, Giri and So were all up there in the group just half a point behind Carlsen. Can this be the moment Caruana gets back on track, or will one of the other young stars have a breakthrough performance? Or might it be Giri who challenges for the crown? There are some obstacles. Anish, Fabiano and Maxime all face a crucial final Grand Prix in Khanty-Mansiysk in May, though perhaps only Caruana will realistically still believe in his chances of snatching one of the two qualifying places for the 2016 Candidates Tournament. 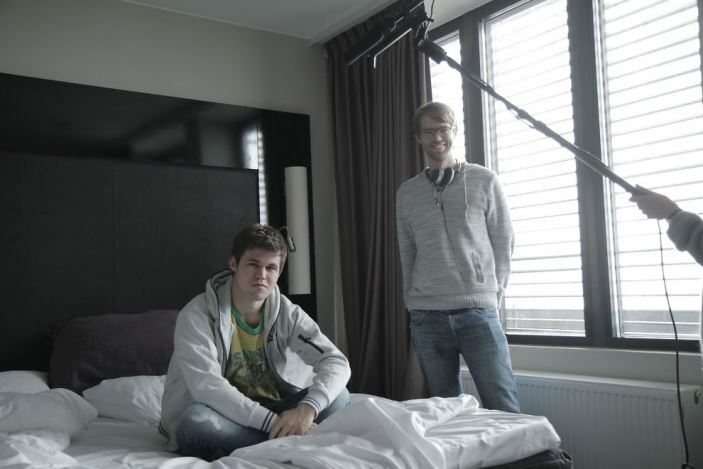 Vachier-Lagrave is about to become a film star while Anish Giri also has a wedding to look forward to this summer! I’m just glad to be in a different city than St. Louis, which turned out to be the worst tournament of my life. 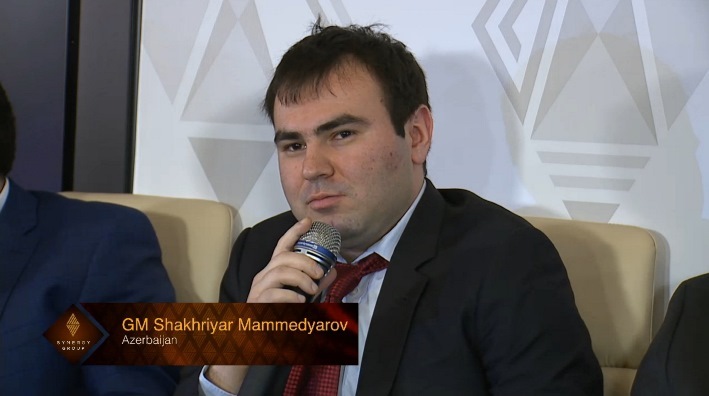 Both Mamedyarov and Mamedov had disappointing tournaments in Shamkir in 2014. Mamedyarov finished rock bottom of the top group after losing both games against Magnus Carlsen and Hikaru Nakamura. Mamedov finished 7th out of 10, but that was in the B Group, and although Azerbaijan would love to see the current and 3-time Azerbaijan Champion putting on an impressive display before next year’s home Olympiad, it’s going to be incredibly tough. Rauf is ranked almost 100 places below all of his opponents, and simple Elo logic forces them to go for the kill. Will Mamedyarov handle the pressure - and distractions - of being on home soil better this year? Mamedyarov, meanwhile, can beat anyone – as he proved by downing Caruana with White in last year’s event. They happen to be paired with the same colours for Round 1 this year, and if Mamedyarov gets off to a good start it might work in his favour that he won’t be held back by the draw he would surely have taken against Teimour Radjabov if his friend and compatriot was playing. In any case, we don’t need to speculate much longer, as it's all about to kick off! Follow the action live here on chess24.